Ulster will wait and see if halfback duo John Cooney and Billy Burns will be available to face Leicester Tigers in this weekend’s final European Champions Cup pool four tie. In a must-win game to guarantee progression to the knockout stages of the Heineken Cup for the first time in five years, head coach Dan McFarland would like to have his first choice fly halves available for the task ahead at Welford Road. However, while Burns started in the thrilling 26-22 win over Racing 92 at Kingspan Stadium on Saturday before suffering a calf problem, Ulster were without Cooney. The Irish international scrumhalf was withdrawn before the game on Saturday suffering from a back spasm. 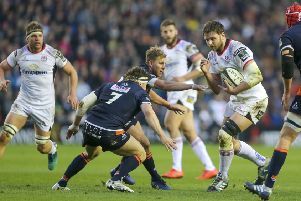 Dave Shanahan stepped up to start at scrumhalf and produced an impressive display as Ulster once again defied the odds to claim the name of another big French side in Belfast. In respect of Cooney, McFarland said: “John obviously had a back spasm and we were hopeful he’s come through. Although the rest of those who played had put their bodies through the wrangle against the hugely physical French side, McFarland said there were no other concerns at present. Ulster were able to field nearly all their big hitters against the previously undefeated pool four leaders Racing, while bringing in young Academy winger, Robert Baloucoune, who scored a try on his European debut. McFarland agreed that it was important to have experienced heads on board. “In Champions Cup rugby is always important to have experienced heads. It would not matter what situation you were in. “I think going to Welford Road, all the more so. They’re a huge club, a club with a proud history and they’ll definitely be wanting to make sure we don’t qualify. “Going over there and having the experience of guys who have been there before will be good. With the dust now finally settled after the penultimate weekend in Europe, the finish line is in sight for those targeting the knockout stages. For Ulster a win is required against Leicester Tigers to secure a place in the knockout stages - probably as one of the three best runners-up across the five pools. To top the group and automatically go through, Ulster need Scarlets to defeat Racing and if the French side picked up a bonus point in that mix, Ulster would need a bonus point at Leicester. Crucial to what Ulster may still need if things went sour at Welford Road - and everyone remembers what happened at Wasps last year when Ulster were in the mix to qualify only to lose to the Premiership side - will be the outcome of Friday night’s Pool Five clash between top two Edinburgh and Montpellier - and the latter winning. Irrespective of all the mathematics at this stage, plus the ifs and buts, McFarland has targeted a win at Welford Road. “That’s it, isn’t it, we’re still in a situation where our qualification is in our own hands and that is how we want it. “We have the opportunity and we understand the task ahead of us,” he said.